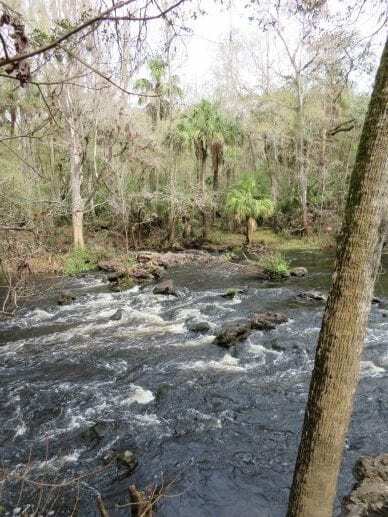 The park’s most unusual natural feature is a series of rapids created by the river as it flows over outcropping of Suwannee limestone. 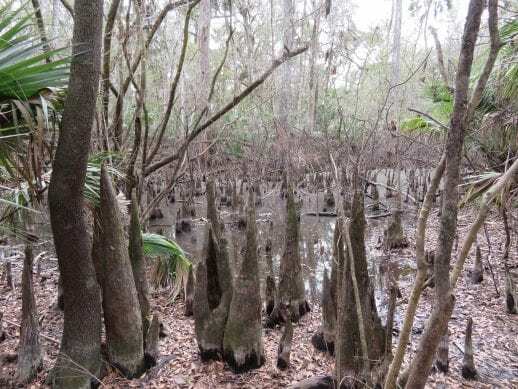 Cypress swamps, pine flatwoods and hardwood hammocks are distinctive features. Commonly seen animals included gopher tortoises, woodpeckers, owls, bobcats and deer. 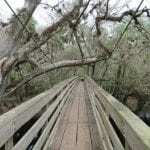 Hillsborough River State Park is a breathtaking oasis of natural and historical significance. The park has something for everyone who enjoys outdoor recreation. Anglers can test their skills at freshwater fishing in the river for bass, bream, and catfish. (A Florida fishing license is required.) 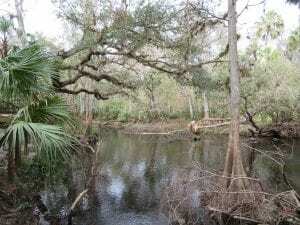 Visitors are welcome to canoe the Hillsborough River. There is a swimming pool located right in the state park equipped with a recreational area and concession poolside café and gift shop. But the best part of all is taking advantage of the hiking and biking trails. The Hillsborough River State Park offers some of the state’s best hiking. It also is very family friendly with great picnic areas, playgrounds, youth camping, primitive camping and much more. In addition to the best hiking trails you will also find bike trails and canoeing down the peaceful portion of the river. You can also enjoy picnicking under one of the Pavilions built by the Civilian Conservation Corps. The Pavilions and a recreational hall equipped with a kitchen are available for rental. For RV and tent camping, campsites are fully equipped with water, electricity, fire ring, and picnic table. Campground amenities include laundry facilities, showers, restrooms and a dump station. Are reservations are recommended and fees are available at the Ranger Station. A “Spirit of the Woods” Poolside Café and Gift Shop offers breakfast and lunch menu selections, along with snacks. The gift shop offers necessities, souvenirs and a selection of field guides and books related to the park and Florida. Park Rangers provide nature walks, campfire programs, historic Fort Foster tours and special programs are conducted on a regular schedule. Current program information is available at the ranger station. The park is open 365 days a year. An entrance fee is required. Pets are permitted in designated areas. 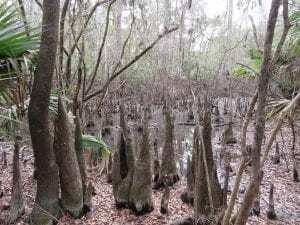 For more information on joining the Hillsborough River State Park Society at 813-987-6771. For camping information contact Reserve America at 800-326-3521 or visit www.ReserveAmerica.com. The park’s history is almost as interesting as its spectacular views. Activities in the area date back to prehistoric times when native people hunted, fished, and forage along the river’s flood plain. The river was named in the late 1700s when Wills Hills, the British Colonial Secretary and Lord Earl of Hillsborough, was give jurisdiction over the area and sent surveyors to report the new colony. After Florida became a United States Territory, settlers migrated into the newly opened land, which created conflict with the resident Seminole tribes. The Unites States government’s plan to transport the Seminoles west to Oklahoma sparked the beginning of the Second Seminole War. 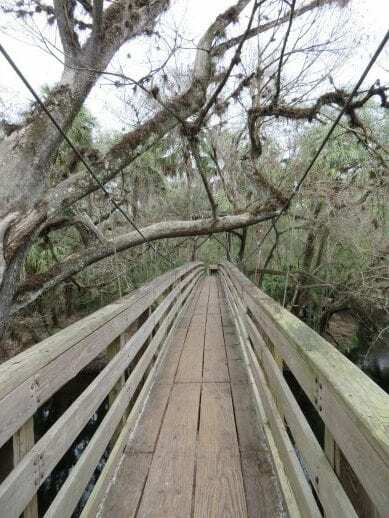 In 1935 Fort Alabama was built to protect the bridge over the Hillsborough River on the trail from Fort King (Ocala) to Fort Brooke (Tampa). The fort was abandoned few months later and destroyed by fire. Fort Foster was built on the same site in the winter of 1836, where visitors today can experience fort. In the 1930s during the Great Depression, the Civilian Conservation Corps (CCC) established the area surrounding the river rapids as a public park. Many park structures and the suspension bridge are examples of the CCC’s style of rustic architecture and design to be in harmony with the natural environment.